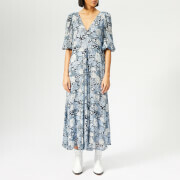 Cut from navy fluid check, the ankle-skimming midi-dress from London based fashion house Self-Portrait boasts a fitted bodice that falls to a flared pleated midi skirt with contrast ivory panelling along the hemline. A matching trim lines the high neck that at the nape, fastens with an ascot tie feature. A satin ruched insert cinches the hips for a flattering shape, and long voluminous balloon sleeves with rear splits expose the arms. Secured with a concealed zip closure below the rear V-neck and detailed with cold shoulder vents. Partially lined with an in-built slip. Main: 64% Elastomultiester, 31% Polyester, 5% Viscose. Lining/Trims: 100% Polyester.